(Nanowerk News) U.S. researchers have developed a new type of membrane that can be made reversibly porous at the flick of a switch. A drug contained within a membrane-based implant could be released 'on demand' the scientists suggest, making it a potentially useful and novel way for the controlled delivery of drugs such as anaesthetics. Once the dose has been delivered, the membrane can be re-sealed until the next dose is required. A team led by Daniel Kohane of Harvard Medical School in Boston, MA, harnessed the thermosensitive properties of poly(N-isopropylacrylamide) (PNIPAM) to form the basis of the new system ("A Magnetically Triggered Composite Membrane for On-Demand Drug Delivery"). This material can form a hydrogel which is swollen in its native state but which collapses upon heating. 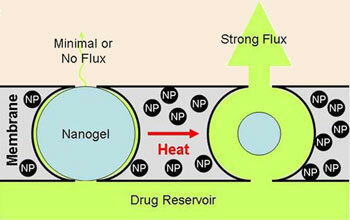 Applying an oscillating magnetic field causes the nanoparticles to heat up and the nanogel to collapse, creating a pathway for the drug to move from the reservoir out of the membrane. If the membrane is exposed to an oscillating magnetic field, the magnetite nanoparticles heat up, in turn warming the PNIPAM by a few degrees - sufficient to cause the particles to collapse but not so high as to affect surrounding tissue. This leaves voids in the membrane, opening up channels from one side to the other. 'When you take away the magnetic flux, the particles cool down, the PNIPAM re-expands and seals the cavities,' says Kohane. In this way the membrane's porosity can be remotely switched on and off. To demonstrate the potential effectiveness of the system in drug release, the research team encapsulated the dye sodium fluorescein in the membrane and implanted it in rats. They showed that the membrane remained intact and 'switchable' over multiple cycles, that the amount of dye released was in proportion to the length of time that the magnetic field was applied, and that the membrane was non-toxic and biocompatible. By modulating the magnetic field it should be possible to fine-tune the rate of drug release, in addition to the frequency and duration of treatment. Kohane is already looking ahead to the possible treatment options the new system could offer patients: 'We think that our system could be good for something like chronic pain, where a dose of painkiller could be given by the patients themselves, or for localised anaesthesia or chemotherapy,' he says.